Dibenzocycloheptene is a chemical compound featuring two benzene rings bound to a cycloheptene group. Various tricyclic antidepressants (TCAs) contain the dibenzocycloheptene moiety in their chemical structures, including amineptine, amitriptyline, amitriptylinoxide, butriptyline, demexiptiline, nortriptyline, noxiptiline, and protriptyline. 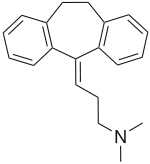 Cyclobenzaprine, a skeletal muscle relaxant, also contains this functional group.